The Gol Gol Big One Poker Classic is one of the major poker events held in Australia. Its 2015 edition will be held on July 11 and 12. The poker industry in Australia is in excellent health. One can find in the country all categories of players including cash game enthusiasts, poker pros as well as simple amateurs. They regularly visit casinos and clubs to play. 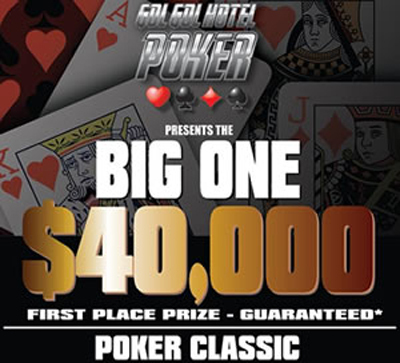 The Gol Gol Big One $ 40k Poker Classic is precisely an event that can bring them together on the same stage. It will guarantee to participants a fun and playful atmosphere that they find in clubs while having the appearance of a professional poker tournament like the World Championship which takes place in Las Vegas right now. Last year, the Gol Gol attracted 94 players. The victory was awarded to a regular player named Trev Mosaati. The latter ousted Dean Francis in the final duel. Other notable of the game like Craig Ivey, Billy Argyros and Michael Fadersen were also present. For the next edition, organizers offer a competition with a $ 1,100 buy-in. Regarding its structure, the players who will be present in the poker room of Gol Gol Hotel located on the Sturt Highway in the Mildura area will receive 100,000 starting chips and will compete in 40-minute levels of play. The blinds will increase incrementally. Note that several qualifying satellite tournaments for this event were organized and 38 seats were distributed to the lucky ones.